Become a CAM Raleigh member to attend this special exhibition preview. Become a member at the CAM Raleigh member to attend this special exhibition preview. RSVP to members@camraleigh.org by Tuesday, January 29, 2013. 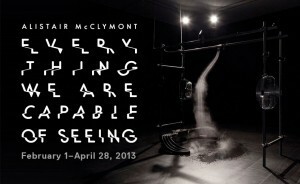 Experience a special presentation of McClymont’s nighttime rainbow, which lends its title to the exhibition: Everything We Are Capable of Seeing. Meet the artist, enjoy sweets, savories, drinks and DJ from 6–9 p.m. CAM Raleigh middle school docents from 6–7:30 p.m.